Runes are a focal point of modern paganism, since they portrait a certain mysticism sought after by many, especially by those of the esoteric variety: Ancient symbols of a long gone ancestral culture, imbued with great symbolism and power. But are they really that laden with symbolism, are they really what many today perceive them to be? The short answer is No. The biggest problem, in my opinion, stems from the often completely nonsensical usage of runes and interpretations that are not backed by our current scientific understanding of Old Norse culture. So, for starters, I’d like to give a brief history of runes and clear up some very common misconceptions. 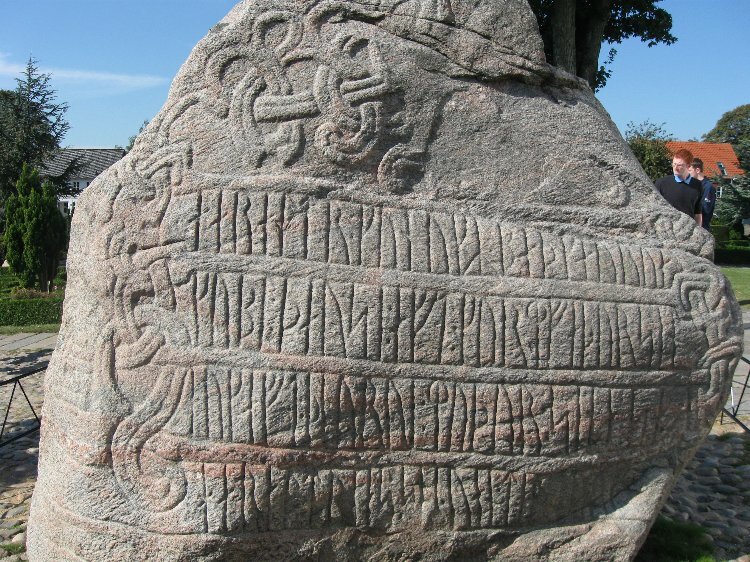 As the Northern Germanic dialects of Proto-Germanic began to form a own language, Old Norse, the runes began to change with the language, though not in a way that makes a lot of sense. While normally alphabets tend to get bigger when new sounds get introduced into a language, the set of runes used got a lot smaller in the Scandinavian region, while the Old English futhorc stayed more like Elder Futhark, while adding some new runes to fit the sounds of the language. The Younger Futhark contains 16 instead of the original 24 runes, with some runes like *perthro having had fallen out of use for at least 300 years because of the rarity of certain sounds, some changing into easier forms, like hagall. The new runic futhark was rather hard to read and still only used epigraphically, but in a greater extend than before, upgrading from around 350 finds for Elder Futhark to around 6,000 for Younger Futhark. Runecarving was a profession, as attested by some stones, and not an easy one, judging by the hard writing rules and by some badly made copies of runestones with nonsensical texts that also date back to the timeperiod – 8th/9th .- 12th century. When texts were written, no runes where to be repeated, even between words since word separators where not the norm. Also, runes articuled in the same region of the mouth were very often left out. To see what this means in practice, let’s have a small lesson in rune transliteration and then translation. When converted to latin characters, they look like this. Haraldr konungr bað görva kumbl þausi aft Gorm, faður sinn, auk aft Þórvi móður sina. Sá Haraldr es sér vann Danmörk. In conclusion, the runes were never (apart from one attempt in the middle ages to write laws down like that, but it didn’t catch on, see Codex Runicus) used in a traditional, literarical way, but were rather a way for some elite class of runemasters and local rulers to record stuff, mark ownership or use “magic”. Full disclaimer: I don’t go into everything and focus strongly on Scandinavia, since I didn’t want to write a full novel. If you’d like to know more in depth, please refrain from using popular, often wrong sources, especially on the internet, and instead look at books from the likes of Düwel: Web Archive: Rune Bibliography. A whole lot of these interpretation are based on NOTHING but the writers imagination. There are very few things we know for certain: We know the names of the runes from Old Norse and Old English rune poems from the late middle ages, which were written down in christian times, making these an uncertain source since runes had been out of use for a long while by then. From these names, we can reconstruct the names of the Elder Futhark, but we know nothing for certain in that period. We know that they most likely knew the names of the runes and used them seldom as placeholders for words, e.g. ᛟ as short for *othala, meaning estate, heritage, inheritance. Beyond that, we have no sources as to what runes were associated with. While the edda contains some references to runes, it is hard to attribute certain meanings to specific runes. What does this mean for modern paganism? It means that most of what is “taught” about runes today is just flat out fantasy with no basis in tradition, with runes being treated like magic, while ignoring their historic background. While I don’t personally believe in magic, I don’t judge those that do. What I do mind is passing of some New Age interpretation of these runes off as some ancient wisdom, while those interpretations aren’t even 200 years old. If you see meaning in these symbols beyond what we know about them, if you feel they represent something bigger, I will not discourage you, I even think so myself, but please keep in mind, that this is your interpretation and not something based in what we know about the ancestors. There is a lot of misinformation disguised as truth out there, and I highly encourage you to stick to scientific, modern sources when trying to learn about runes. I leave you with the pagan sounds of Sowulo and bid thee farewell, until next we meet. Vertu blessuð. I am a student of Norse culture and religion and passionate Germanic Pagan. I talk about heathen issues and how these relate to modern society.